Shane Hansen of Hansen Industries and Albert Alvarez of Alvarez Electrical & Dairy Service, Inc. in Visalia, California, had a vision of providing products and services to enable dairy producers build a sustainable future. Hansen has been active in the dairy industry since 2004 and Alvarez since 2006, providing the two owners with in-depth knowledge about the industry in their region as well as producers themselves. Recognizing that sustainable dairying in California is possible with the right tools, the two decided to join together to create Pro Dairy, where they could bring access to Lely's suite of products to dairy producers in their area. "Lely is going to be a key item as dairies try to stay in business," said Hansen. "It's the best robot company there is and has the technology we need going forward." Hansen and Alvarez have made it a point throughout their time in the industry to always stay current with the technology while addressing the needs of their customers. They saw dairymen struggling with labor demands and low production. It's Hansen and Alvarez's belief that Lely products can provide those producers with the answers they are looking for. Lely offers total solutions that help solve many of producer's day-to-day needs. With a complete portfolio ranging from automated feeding systems to cow brushes and milking robots. Lely has you covered for the entire life of the cow. 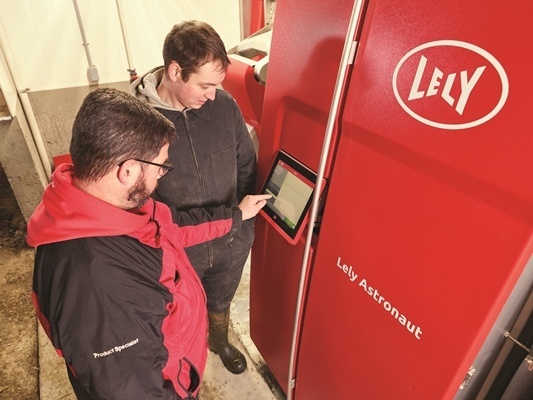 In addition, the Lely T4C management system connects these products, providing reliable real-time data, placing quick and efficient decision-making within easy reach. "With the Lely system, these dairies in a bad economy will have a chance to keep moving forward,” said Hansen.